The Netgigs story started in a suburban backyard and I was proud to have been invited by the wonderful Joe Mac to perform on the acoustic show with Jack Buchanan and Ben McNeil. 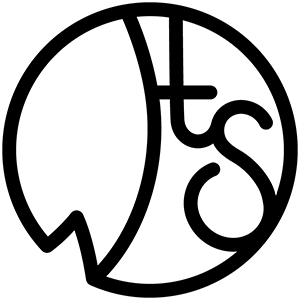 Netgigs is a streaming service for live music. The team have recorded a full series of shows, mainly with bands until this last episode, which is fully acoustic. Joe had a vision which he has now made global. Netgigs filmed bands and solo artists at Fowler’s Live just prior to the closure. But, the footage was presented at Big Sound Music Conference 2018 in Brisbane. This has lead to more opportunities for Netgigs and we have been watching it grow ever since. SCALA returned after the 2019 Fringe on March 21 and healthy sized audiences continue to attend these great showcases. Subscribe to our fortnightly email to keep up to date with who is appearing. Apply online for a spotlight and / or showcase. Song Kitchen is still operating at the Box Factory, but look out for some upcoming changes. Sadly, the Gawler event has been put on the back burner due to lack of bodies to run the proceedings. Too much for one man. If you would like to help out, please contact us via FB or email on our website, for more information. Keep an eye on the new look SCALA Website and/or FB Page for details of the coming events. The AGM held on April 5, 2018 saw a new, enlarged SCALA Board elected, increasing from 8 to 12 members. This strategy has proved successful, with major improvements made to the website, communication and running of events. I make an annual pilgrimage north to visit family and old friends each year and my most recent trip was in October 2018. This time, I went when the weather was just perfect and I took with me, my husband, eldest son and his partner. We landed there right on my mother’s birthday. Carinya Aged Care, where she now resides, celebrates everyone’s birthday on the second Tuesday of the month. In the afternoon, they had their ‘Happy Hour’ and served beer and wine. I was invited to perform for everyone during this happy afternoon event. A lovely attentive crowd and there was even dancing! 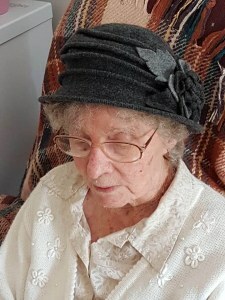 Mum turned an amazing 93! A rather drawn out affair, recording began in September 2016. With help from Emily A Smith, Ali Foster, Shireen Khemlani, Mick Albeck we laid down the beginnings of six new tracks. Under the steady mixing hand of Anthony Stewart at Red Brick Music and Neville Clark, Master of mastering, at Disk Edits I released a single ‘I Tried To Write A Christmas Song’ in time for Christmas. Back in the studio in December, I made a start on a further four tracks and was overjoyed when the Sherrahs agreed to add their amazing harmonies. During 2017, the rest of tracks came together and I was able to launch Good Heart in November. Good Heart EP in the Charts! Good Heart EP spent several weeks in the 3DRadio 20+1 charts in December / January peaking at No.5. A few of the tracks, mainly Good Heart; Pity Me and Can’t Stand By have hit the No.1 and 2 spots Australia wide on N1M [online music platform]. Chic Chic Boom has hit No.4 for N1M Americana charts in Australia! The Pity Me music video has received an award for Best Americana Music Video and the track is being played over 50+ digital radio stations around the planet. October update: All tracks have now been mastered by Neville Clark at Disk Edits. Courtney Robb has designed the artwork. In April I am phoning in to speak with Cathy and Clint on their Friday morning show 12th on 3MDR 91.7fm and in studio with Chris Carpenter on Thursday Hills Chat show at Hills Radio 88.7fm Thursday 18th. January 5795 spins across 50 digital stations around the world. In September After my gig at Three Brothers Arms in Macclesfield, I was invited into Hills Radio 88.9FM in Mt Barker to chat with Crash Carpenter on his Hills Chat Show. We talked about my impending release Taking It Well and my plans for Tamworth. Country Capital Radio [digital station in Tamworth] has uploaded Good Heart and my new EP Taking It Well. Chic Chic Boom, Good Heart and Can’t Stand By was accepted by AMRAP Airit services and made available to Community Radio Stations around Australia as of July 1. In July the following stations added Chic Chic Boom to their playlist and/or libraries. Sunday Breakfast on Highland FM in Bowral NSW is playing Chic Chic Boom; Good Heart and Can’t Stand By! Mostly Folk fun and Friends on Whitehorse Boroondara fm Community radio in Ashburton Vic is playing Chic Chic Boom; Good Heart and Can’t Stand By! VOX FM in Woolloongong NSW has added Chic Chic Boom; Good Heart and Can’t Stand By to their station library! The AMRAP Show on 5GTR FM in Mount Gambier SA is playing Good Heart! Before my launch of Chic Chic Boom at Two Chics and A Boom Umbrella show, I managed a quick interview with Phoenix on his Threedradio show 93.7fm The Cuckoo Nest Thursday 19th July. Ian Crombie is still playing my tracks on Newcastle Radio 16 and just recently Mark Theile from 5Triple Z in McLaren Vale is programming tracks from the Good Heart EP during Folk Harvest. Adelaide Songs performed to a SOLD OUT crowd at The Stone Pony in Willunga Saturday April 7th. Ably support by Goldstein. In late November, we travelled to Burra and Auburn to host sessions with local writers and organisations. We invited anyone wanting to join with us to write songs about the mid north. The sessions were successful in drawing interest and were followed up in January. The shows will be held in 2019 SA History Festival. This is a HATs project for which they have received a grant through Country Arts SA and you can find more details on their website. 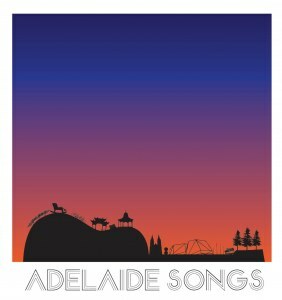 The Adelaide Songs crew presented another show during the 2019 Adelaide Fringe. Four great shows and four great audiences witnessed the debut performances of some new songs and a smattering of the old and loved tunes. We received two 4 Star reviews from InDaily and The Clothesline. Big thanks to La Bohème for having us at their lovely venue. We hope people will continue to support them during what is a very tough period for them while they wait for the ongoing renovations of Her Majesty’s Theatre which has impacted their trade significantly. Paul Roberts, Alan Hartley and myself presented a few songs from our impending Fringe Show at The Gov Variety Show Saturday 16th Feb. We shared the stage with a fab line up of great entertainers including Jimmy Marin (Music) | Nick Coutts (Music) | Kim Le (Comedy) | Rudes (Comedy) | Yorke Heath (Music) | NeverLight (Music) Thanks to Ross Voss for putting on this great show. Very exciting news, we finally stepped into the recording studio in November to begin an official Album. We laid down four songs and returned for two more sessions in January. An album launch is planned for The SA History Festival in May and as a bonus, Satomi Ohnishi, our hard working percussionist, is working on an official song book! There may well be a couple of early releases pre Fringe, so keep you ears open. Hint: I urge you tune into your favourite community radio stations. We took a presentation of the project to SAPA via Country Arts SA in Noarlunga at The Hopgood Theatre in June. As a result we were invited to part of the Back To Back Short Show Festival at The Star Theatre in Hilton, October 20th. We were also asked to present a short set for the History Trust, at their Making History Conference, November 2. This, an apt lead up to the 2019 SA History Festival. The same pitch landed us a corporate gig in Gawler in October 2019 at the Gawler Institute. So if life is getting you down and even if it’s not, turn off the TV and get into live music. Whether to listen or participate, here are some FREE or very low price events.